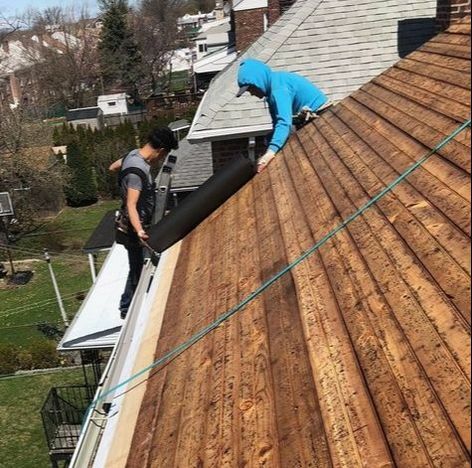 Skyward Roofing in Staten Island performs a wide variety of budget friendly roofing services for residential and commercial clients alike. The types of roofing we service are asphalt, metal, cedar shake or shingle, slate, flat roofing membranes (TPO and EDPM) and SPF (Spray Foam Roofing). If your roof is reaching the end of its lifespan and leaks are happening with every storm, it's time to inspect your roof. Skyward Roofing will provide a free roof inspection and repair or replacement estimate without any strings attached. You will not find another roofer that will repair/replace your roof, the way the manufacturer expects, cheaper than we will. Our estimates cover quality material from well-known roofing manufacturers. 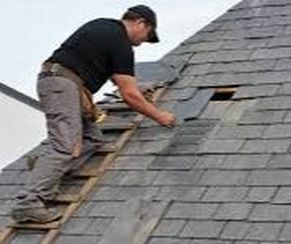 Shortchanging proper roofing installation methods and hiring unskilled labor is how some roofers quote such low estimates. Replacing a roof way before its expected lifespan is the most expensive roof you'll ever buy when you engage a devious roofer. Asphalt Shingles: Sometimes called composition shingles, about 80% of all pitched roofs in the USA are covered with these. There are two kinds of asphalt shingles, organic or fiberglass. Organic asphalt shingles have a cellulose fiber base made of recycled paper and wood fibers then coated with asphalt and a mineral coating placed on the front side to resist weathering. 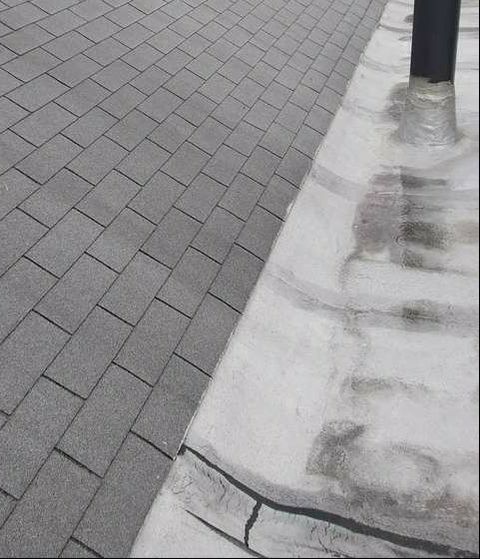 Fiberglass use a base of fiberglass to give the shingle more strength and flexibility then the base is treated with asphalt and a mineral coating applied just like the Organic composition. Life expectancy 20 to 30 with the fiberglass composition on the higher end. Asphalt Shingles require no maintenance besides storm damage repair. SPF Roofing Replacement requires reapplication of the top coating layer to renew the weathering surface of the SPF system for additional durability and longevity. The SPF roofing foam does not degrade with a waterproofing top coat which means it can continually be recoated. In a damaged SPF roof, it is more economical to remove the damaged roofing material, apply new SPF foam to level the roof and then a spray new top waterproof coat. 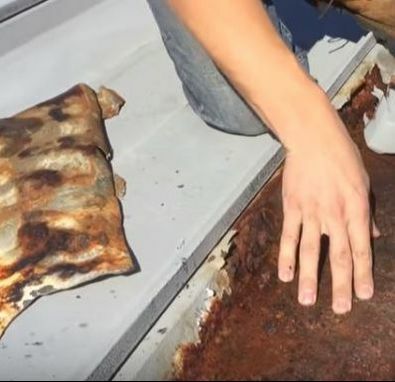 Following the previous steps of a SPF roof renewal, will eliminate the cost of tear off and disposal of the old SPF roof and yield a new warranty. Home Roof Leaks is quickest way to get people to engage a roofer. Moisture damage causes wood decay, electrical equipment damaged, mold blooms that can cause sickness, and ruined personal belongings. Sometimes moisture damage is hidden within the attic or in building cavities which becomes apparent when something collapses. ​Commercial Roof Leaks have many causes, for example debris on the roof may have penetrated the waterproof membrane, drains for water removal could be blocked, and vent and pipe penetrations may need re-sealing. 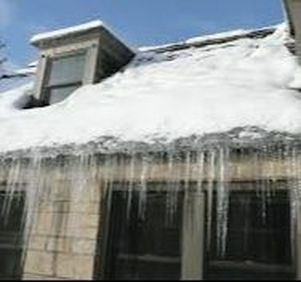 Hard to find leaks may require layers of waterproof membrane to be peeled back to find the elusive leaks, clogged drain pipes may need to be disassemble to be cleared, and pests that may have penetrated the roof by chewing through sealant or worn areas of the roof will have to be removed by pest specialists. 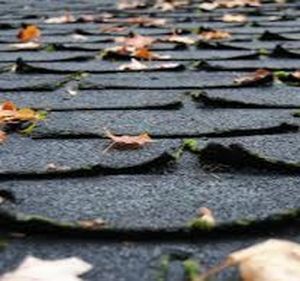 Asphalt Shingles roof repair: The health of your home or business depends on the correct functioning of the asphalt shingled roof. The roof not only protects your business or family from the elements it also allows the dwelling to ventilate- removing excess heat, indoor air pollutants and moisture to the outdoors. Don’t let the repairs add up with an ailing roof- act at the first sign of a problem. 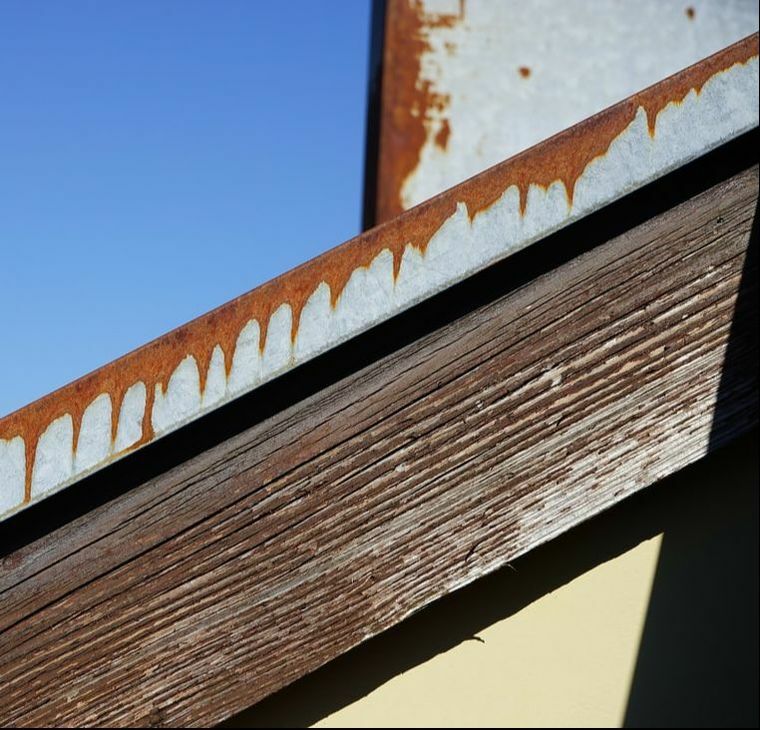 Metal Roofing repairs are generally made along flashings whose sealings may have been compromised, loosen screws for metal panels or for damaged incurred during storms. The damage, if there is no hole, can be wire brushed or sanded out than repaired with metal primer followed with paint the same color of the roof. 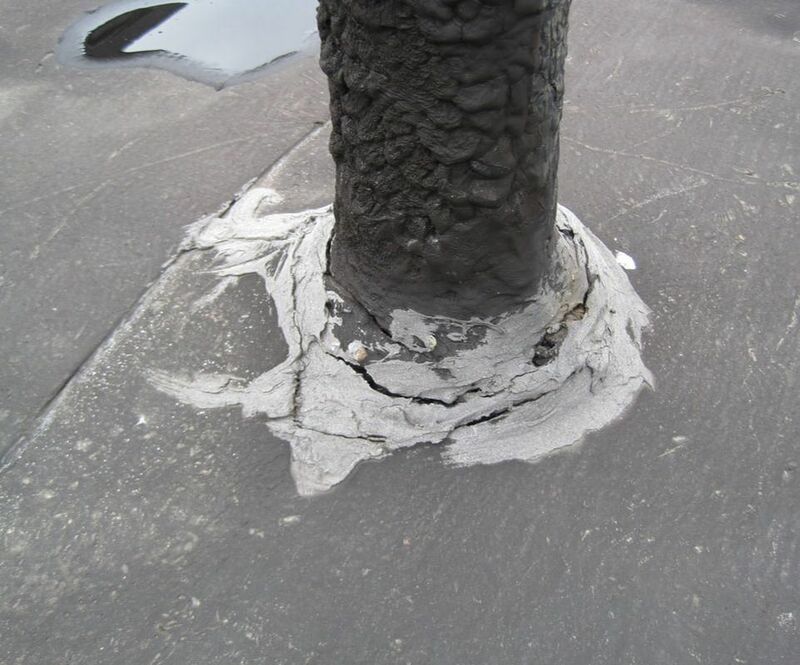 EDPM (a tough rubber membrane) Roof leaks occur along flashings, seams, storm damage to membranes and punctures along foot paths taken by service repair personal or employees. 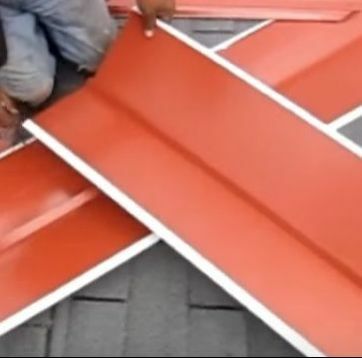 Patches can be made in the membrane that will bring the roof back to a protective state again. 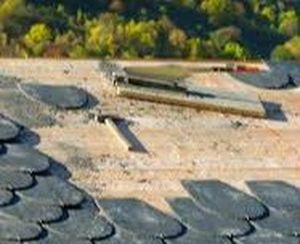 The TPO Roof: To seal the bond correctly between a TPO patch and the roof membrane, specialized equipment is needed. Repairs must be made with a TPO material patch and a hot air welder- most property owners just don’t have those items. Plus, if they tried to get a small patch of TPO material from a roofing manufacturer, they’ll probably be required to buy a lot more than a small piece. Which is why, most property owners end up engaging a commercial roofer. Damaged SPF roofs are generally repaired rather than replaced. The damaged roofing material is removed, more SPF foam is applied to level the damaged location roof and then the top coat is reapplied. A SPF roof renewal, will eliminate the cost of tear off and disposal and yield a new looking roof with a renewed warranty. Regular inspections will catch potential leaks or problems before they can cause secondary damage. 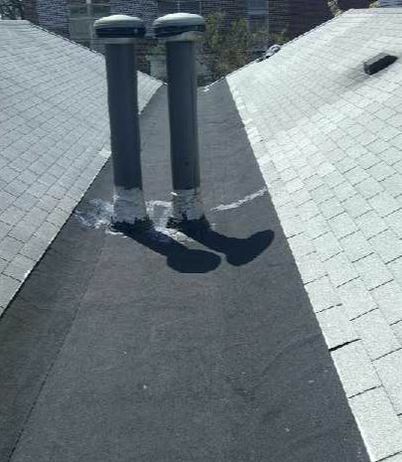 Asphalt Shingled Roofs leaks can be hard to locate. 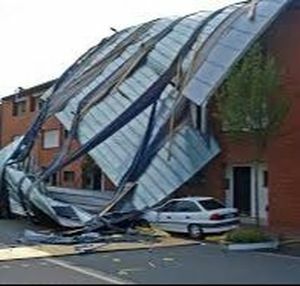 Our inspectors are trained in building sciences and understand how water will sometimes flow hidden along the internal framing of a building till finding its way to ground. 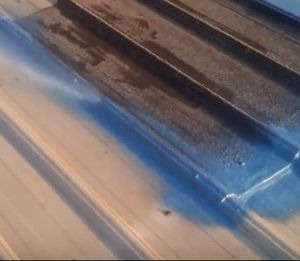 We can find and stop those elusive leaks before the secondary damage is overwhelming- just contact Skyward Roofing. 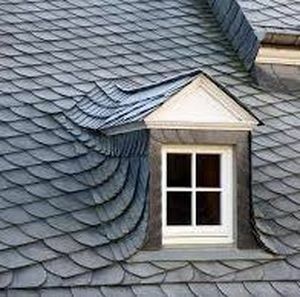 Slate Roofing the costliest roofing option to install has an elegant unpolished stone look available in a large variety of colors, such as gray green, purple, black, red, and a pleasing mottled look with several colors blended in. Historical churches, museums, universities and homes often have slate roofs to maintain and an experienced Slate roof contractor will be able make the roof repairs less visible than a novice. 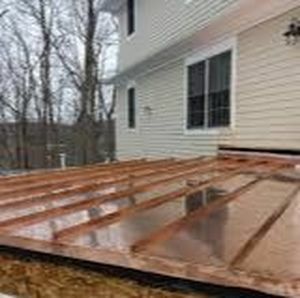 Residential metal roofs can be built of elegant decorative tiles chosen to give a sleek modern look to a home though at a much higher paving cost than asphalt 3-tab shingles. However, sometimes the cost is offset by the ability to roof over an old asphalt roof (no tear off) because government guidelines allow 2 layers roofing material. 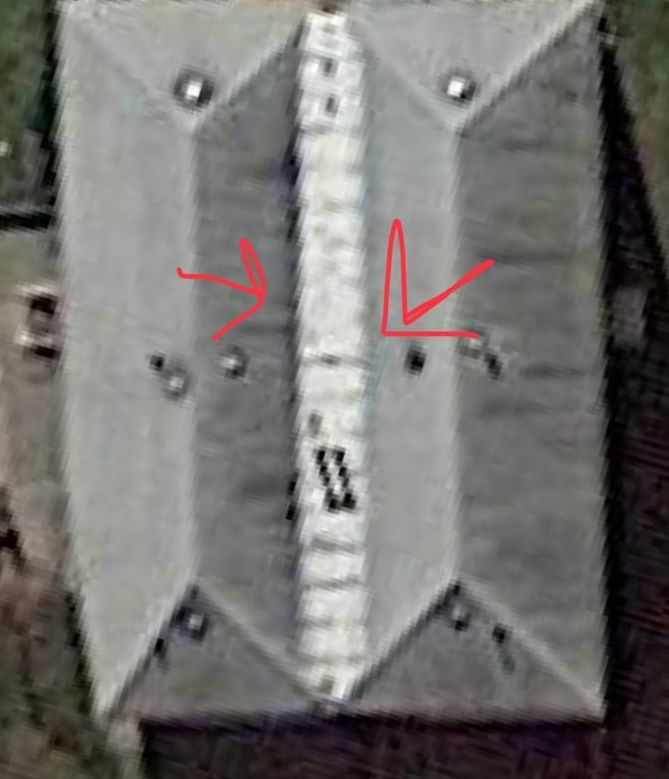 The roof assessment: Skyward Roofing ,at your request,will inspect the problem roof to discover the absolutes that need to be fixed and discuss options and possible upgrades (protective roof coating) you’ve expressed an interest in. Within a short time, the inspection will be followed up by a detailed written report explaining the health of your roof, potential problems, estimate of its additional life expectancy and finally budget friendly solutions to problems found. This report can be hand delivered, texted or emailed whichever works best for you. 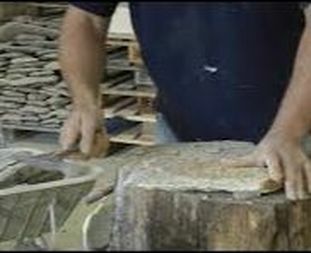 Inspection should be done by experienced slate roofers because they preform tests that require knowledge of what a sound slate tile should look like. For example, if you see white powder on the slate that indicates minerals are leaching from the slate. 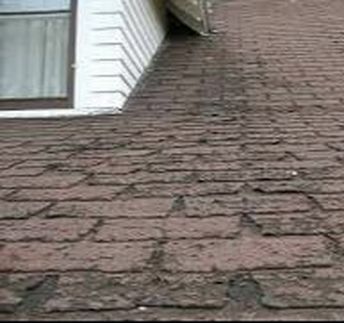 Mineral leaching will happen if the slate tile was inferior from the install or you truly have a very old roof that has spent decades weathering. A few years back some roofers were importing slate tiles from china which are often much softer than American slates. Sadly, people didn’t realize the distinction till the premature decay of their new slate roof. Skyward Roofing only uses the best roofing slates available. A business roof leak will damage inventory and/or operational electrical equipment will be shorted out. These will cause problems with successful daily transactions- a drag on your revenue that needs to be repaired quickly. Skyward Roofing has emergency teams that we can send rapidly to your place of business. They will work quickly to minimize water damage- saving you some of the secondary costs, such as inventory loss, equipment damage, and wet annoyed clients. Business roofs that have flat or low slope configurations use various roofing materials, such as TPO, EDPM membrane, metal, and spray polyurethane foam. All commercial roofs experience wear and tear through the years and may leak, pond water, develop blistering, cracks, some surface erosion. The best way to combat flat roofing leaks is periodic inspection to check for problems before they become disasters. The environment can have a terrible impact on a flat roof. 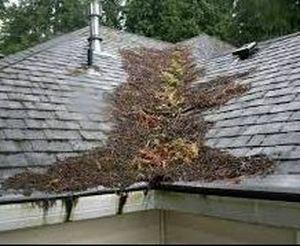 Trees overhanging the roofs can drop fruit, nuts, leaves, needles, and broken branches all of which can deteriorate the functioning of your roofs waterproof system. Trees can also be a highway for critters or criminals to access your roof. Trees are beautiful but they are a main source of outside turbulence brought to your roof and should be kept trimmed back. SPF (Spray-Polyurethane-Foam) roofing systems are economical, energy efficient and long-lasting. 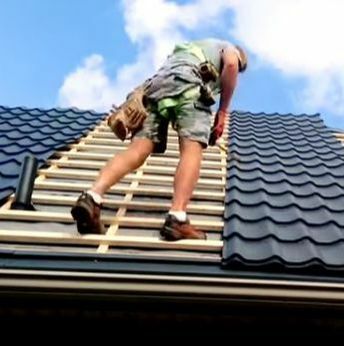 Rest Easy, Skyward Roofing has well trained SPF roofing technicians to send out on these roofing projects not ones that will learn by making mistakes on clients’ roofs. 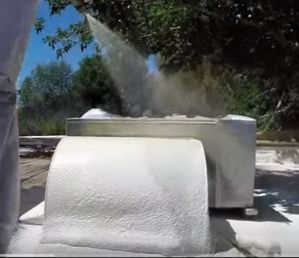 The SPF applicator has to have a very even and steady hand while spraying the foam because any deviation will cause peaks and valleys which will lead to water puddles on the rooftop. Our SPF Roofing technicians are given plenty of practice sessions during training and many hours of on the job training with experienced roofers. TPO (thermoplastic polyolefin) is a single ply roofing membrane that was developed early in the 1990’s as a more budget friendly yet reliable method to replace the more expensive PVC roofing material. 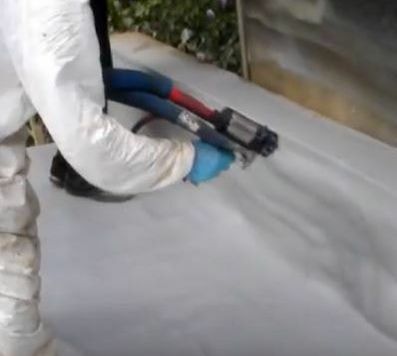 TPO is a thermoplastic or synthetic substance that softens upon heating and hardens as it cools which allows strips of membranes placed across a flat roof to be seamed together with a hot welding tool. TPO once available only in white, grey and black reflective color options is now available in a great array of colors that are also UV resistant meaning “cool” properties- very popular with homeowners or commercial property managers living in area with high electrical supply costs. EPDM Rubber- ethylene propylene diene monomer is used to create a single-ply rubberized roofing membrane to cover like a blanket over a flat roof. EDPM is sold in a range of widths 7.5 to 50 feet, and in 2 thickness, 45 and 60 mils. It can be installed as a complete membrane or ballasted with seams that are connected with liquid adhesives or specially formulated tape. Roof Inspections: You have nothing to lose, by requesting an inspection, but a little time, and will receive in return a cost estimate to repair or replace your flat roof- half the worry is wondering how much something will cost. We require no monetary outlay or preset conditions only access to inspect the troubled roof at your convenience. We will inspect the problem roof to discover the absolutes that need to be fixed and discuss options and possible upgrades (protective roof coating) you’ve expressed an interest in. 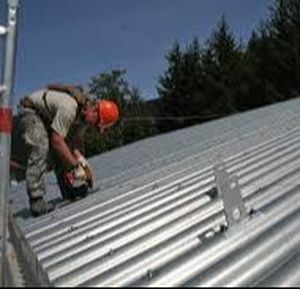 Choice of 2 types of installations methods: Attached with fasteners or glued directly to the roof and seams between TPO strips are heat welded. 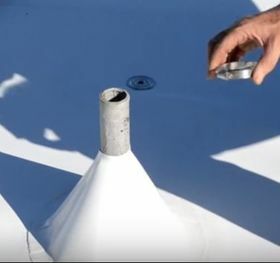 When the membrane is attached with fasteners, wind uplift or billowing might be a problem if enough fasteners aren’t used. 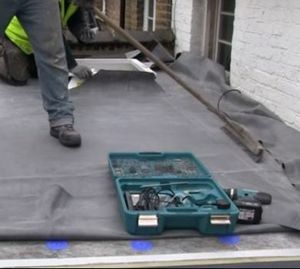 A fully adhered membrane (glued directly to the roof's substrate) does not have a billowing problem but this is the more expensive method of attachment. EDPM roof systems can be painted in a wide variety of colors using the acrylic coating designed for them which makes them a little better looking than a sea of black rubber and light colors will reflect heat from the sun- good for electrical savings. EPDM RUBBER: Ethylene Propylene Diene Monomer (EPDM) a single-ply rubber like membrane placed over substrate on a flat roof. EDPM roofs are fire proof and resist damage from the sun’s radiation. They are also pliable and will breath with a building through the seasons without damage by hot or cold weather. EDPM is sold in a range of widths 7.5 to 50 feet, and in 2 thickness, 45 and 60 mils. Punctures can occur but are readily repair with a new membrane patch. They commonly have warranties of 30 years but many EDPM roofs are still protecting dwellings at 50 years and counting. 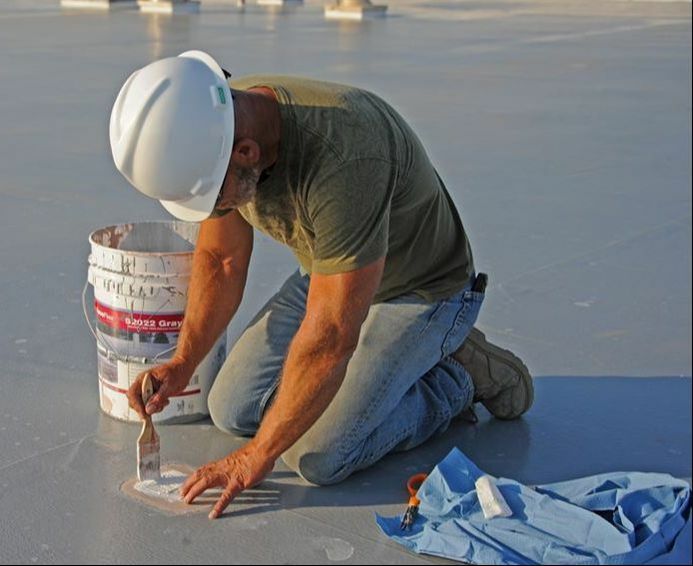 Polyurea roof coating is an elastomer which displays the properties of a synthetic rubber in allowing flexibility as the roof substrate expands and contracts during temperature fluctuations. The white coating reflects as much as 92% of the sun’s UV/heat rays away from the building keeping the inside cooler reducing energy costs. 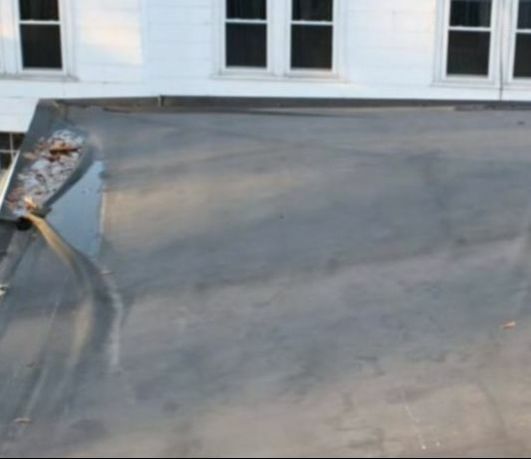 The sun’s UV rays are the leading cause of deterioration to traditional flat or low- pitch roofs because as the rooftop dries out its surface cracks, splits, tears, rips and loses flexibility. 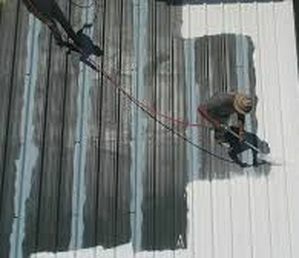 Thus, the reflective properties of the roof coating reduce aging while increasing the roofs life span. By maintaining maintenance of the roof’s coating through periodic inspections and renewal of the coating when necessary, the life span of the roof could last as long as the building. Costs can range from 0.50 to 2.50 per square foot. Basement walls will leak along the floor and wall joints as they are an accesses point with a weakness (a seam). However, even water will leach through the walls themselves if enough water pressure exists outside. Historic Clay tile walls found in older dwellings will mostly leak at the floor/wall joint and the joints between clay tiles. Clay tiles also have empty cores that can form a pool of water that will continually leak into the basement. This non rainy day leakage often confuses clients. 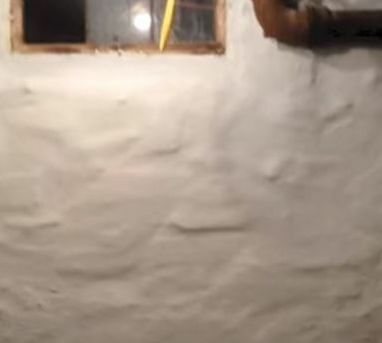 Polyurea coatings are spread onto the walls and seams of wet basement till the coating is about as thick as a dime- this will create the protective barrier. Waterproofing a wet basement is necessary to keep decay, favorable conditions for bacteria, mold, insect breeding and rodents from making your home a misery for its human occupants. Dissolved noxious solids from the surrounding ground water enter through the basement walls, such as chloride, carbon dioxide, sulphur and acid rains polluting the breathing air. Also, when the ground water passes through the buildings concrete basement it picks up other pollutants within the cinder block that end up evaporating in the basement and filtering with the rest of the pollutants up into the living space above.